JAKARTA/NEW YORK, May 31 2013 (IPS) - Standing in front of the two-metre concrete wall, barbed wire and corrugated iron fence that surrounds his mosque, Muhammad Iqbal says he feels like a second-class citizen in his own country. The head of a beleaguered Ahmadiyya Muslim sect in the Bekasi, West Java was forced out of his mosque in April after local authorities shut it down following protests from Islamic hardliners. The Al Misbah mosque in Pondok Gede, about an hour away from Indonesia’s capital Jakarta, was barricaded with an iron sheet by the local municipality to prevent its members from entering. Sixteen people from the Ahmadiyya community remain locked inside as a means of protest, relying on the community to throw food and supplies over the high barricade. “I feel uncomfortable because there is no freedom to practice religion,” Iqbal told IPS on Tuesday in front of his mosque, which has been offering a place of worship since 1998. This situation experienced by Bekasi’s Ahmadiyya is certainly not an isolated one. In the same province as the Al Misbah mosque, local authorities demolished a Christian church in March after they claimed the congregation did not hold a valid building permit to worship. Pastor Torang Simanjuntak of the HKBP Taman Sari church in Setu, could only stand back and cry with his congregation as they watched the destruction unfold before their eyes. International world leaders have often praised the archipelagic nation, which requires its citizens to choose from one of only six official religions, as a model for religious harmony. But recently human rights groups have documented a rise in religiously motivated conflict and discrimination. Attacks on minority religious groups including Ahmadiyahs, Bahai, Christians, and Shia Muslims have increased, from 244 violent attacks in 2011 to 264 in 2012 according to the Jakarta-based Setara Institute. Many critics, including international rights group Human Rights Watch, point to the government’s “inaction”, “complicity” and the nation’s discriminatory laws which include permit regulations for houses of worship and the highly controversial 2008 Ahmadiyya decree, which bans the minority Islamic faith from propagating their belief. But Indonesia’s secretary general for the Ministry of Religious Affairs, Bahrul Hayat, dismisses any ideas of intolerance in his country, deeming the nation a model place of religious harmony. Indonesia is among the top 15 countries in the Pew Research Center’s 2012 social hostilities index, which monitors religious freedom of 197 countries, and is listed as a country with “very high government restrictions on religion,” alongside Afghanistan and Sri Lanka. Daniel Baer, the U.S. Department of State’s deputy assistant secretary for the bureau of democracy, human rights and labour, who was a witness at last week’s Human Rights Commission Hearing on Indonesia in Washington D.C., acknowledged that Indonesia’s issues regarding religious intolerance were complicated. However, Baer noted that despite the complexity there were certainly proactive actions that the government could and should take now. Governments don’t just a have a responsibility to participate but they have an affirmative responsibility to protect people,” he told IPS. Aggravating this already contentious issue is an award that Indonesia’s President Susilo Bambang Yudhoyono received by New York-based interfaith coalition the Appeal of Conscience Foundation on Thursday night. After significant criticism from Indonesians, which included protests and petitions, Yudhoyono accepted the World Statesman award in recognition of his work to support human rights and religious freedom in the country. The Foundation, whose officials declined to be interviewed for this story, instead issued a statement explaining their decision to honour Yudhoyono. “As the first directly elected President of the world’s most populous Muslim Country, President Yudhoyono is recognized for his pursuit of peace and helping Indonesia evolve into a democratic society and an opponent of extremism,” the Foundation said. An IPS request for comment from the Indonesian Mission to the United Nations was not responded to by deadline. 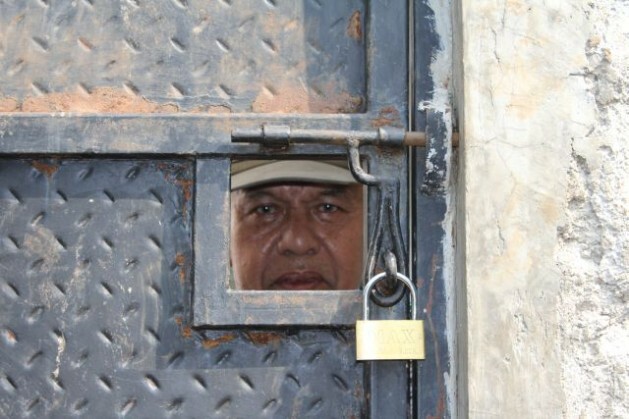 However, John M. Miller, National Coordinator for the East Timor and Indonesia Action Network, who organised the protest, told IPS there has been little willingness to prosecute previous human rights abuses. “[ETAN’s] position is that the Indonesian Foreign Ministry has been asked to find awards for the president, and are trying to burnish his image as a statesman and humanitarian” before he leaves office, Miller said. Kurnia Hutapea, an architect, traveled from Baltimore to attend the protest. A Christian, his family had their church destroyed in Indonesia. “To [have to] get a permit to build churches, that’s not freedom of religion at all, and that’s why I smell something behind this award,” Hutapea told IPS. Andreas Harsono, Indonesia researcher for Human Rights Watch, also believes that President Yudhoyno’s leadership is in direct conflict with the foundation’s ethos. “The Yudhoyono government’s failed to confront militant groups whose thuggish harassments and assaults on houses of worship and members of religious miniorities has become increasingly aggressive,” Harsono told IPS. Iqbal said on Tuesday that he hoped the award would be an incentive for improvement. “Wouldn’t it be nice if the president could fix religious intolerance in his own country first?” the Ahmadiyya leader said. Emilia Az, a Shia Muslim who helps mediate resolution conflicts between religious groups, echoed Iqbal’s concerns. It would be OK for him [the president] to accept the award, but he has to solve the problems of minorities before he decides to go,” Az told IPS, who gathered with minority groups on Sunday to present a mock award to the president showcasing images of intolerant acts from across the country. *Lucy Westcott reported from New York. A photo apparently of Indonesian migrants eating a dismembered Papuan man has come to light today just hours after a Indonesian ‘cyber’ group hi-jacked Facebook accounts including the group account of the pro-independence KNPB group. This comes a week after Indonesian police made another political arrested taking KNPB member Victor Yeimo and his phone with account details into custody. The photo of cannibalism is too graphic for publication.